"Bole Airport" redirects here. For the airport serving Bole, China, see Bole Alashankou Airport. 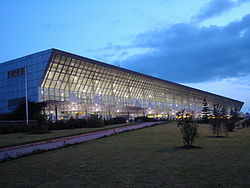 Addis Ababa Bole International Airport (IATA: ADD, ICAO: HAAB) is in the city of Addis Ababa, Ethiopia. It is located in the Bole area, 6 km (3.7 mi) southeast of the city centre and 65 km (40 mi) north of Debre Zeyit. The airport was formerly known as Haile Selassie I International Airport. It is the main hub of Ethiopian Airlines, the national airline that serves destinations in Ethiopia and throughout the African continent, as well as nonstop service to Asia, Europe, North America and South America. The airport is also the base of the Ethiopian Aviation Academy. As of June 2018, nearly 450 flights per day were departing from and arriving at the airport. In 1960, Ethiopian Airlines realized the runway at Lidetta was too short for its new jet aircraft, the Boeing 720. Thus a new airport was built at Bole. Phase One: Add a parallel runway and expand the old runway. Phase Two: Construction of a brand new terminal with a large parking area, a shopping complex and restaurants. Phase Three: Construction of the 38m control tower (double the height of the previous one) and installation of new electrical and fire-fighting equipment. The expanded old runway and the new runway are capable of handling the Boeing 747 and Airbus A340 aircraft. The new parallel runway is connected by five entrances and exits to the old runway, which serves as a taxiway. The proposed terminal houses a high tech security and baggage handling system built on more than 43,000 square metres of land. The terminal will also have banks and duty-free shops. The new control tower would be built in between Terminal 1 and Terminal 2, replacing the old control tower. 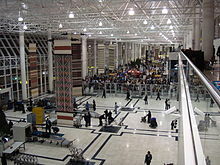 In 2003, the new international passenger terminal was opened, making it one of Africa's largest airport passenger terminals. The new terminal is capable to handle about 3,000 passengers an hour. This project was worth a total of 1.05 billion birr ($130 million). At the time, the airport was one of a number of airport terminal constructions that have been underway in Ethiopia. In 2006, a new cargo terminal and maintenance hangar was opened five months late. This was because of expanded specifications vastly to improve Ethiopian Airlines’ handling capacity and needs. The facility can accommodate three to four aircraft at a time. This project was worth a total of 340 million birr. At the same time, the first Airbus A380 arrived at the airport to undertake tests to validate its Engine Alliance GP7200 engines' performance from high altitude airports. The airport is capable of accommodating the A380. In 2010, the Ethiopian Airports Enterprise announced another expansion project worth $27.9 million at the airport. The project will include expansion of the aircraft parking capacity from 19 to 44 in order to accommodate heavier aircraft such as the Boeing 747 and Boeing 777. In the first phase of the project, 15 parking stands will be constructed and the remaining will be completed in the next phase. The expansion will help in easing air traffic congestion due to increase in international travel. This would lead to the new expansion plan in 2012. Expansion of the passenger terminal, cargo space, hangar, the runway and construction of the hotel is currently being completed by Chinese state-owned companies. The expansion work is being undertaken in two phases on an 80-hectare site. The first phase of the expansion work had enabled the airport to accommodate 15 additional aircraft, reducing traffic congestion at the airport. The second phase of the expansion work will enable the airport to service 10 additional aircraft. The airport will be able to service a total of 44 aircraft upon the completion of the expansion. The airport also plans to expand the apron which purportedly can solve the persistent aircraft parking problem it faces particularly during large international conferences. In 2012, expansion of the new passenger terminal was announced. The outlay of this expansion was projected at $250 million. At the same time, a new ramp was completed and can now park 24 aircraft. Another ramp is being built for 14 more aircraft. At the same time, the first phase of expanding the taxiways and adding more aircraft parking was completed. Eventually, this will lead to the expansion of the terminal. This all falls in line with Ethiopian Airlines’ plan, "Vision 2025". According to the CEO of Ethiopian Airlines, the east wing of the newly expanded airport is expected to be operational by the end of June 2018. The whole expansion project should be completed by the end of 2018, enabling the airport to accommodate up to 22 million passengers per year. On 27 January 2019, Abiy Ahmed inaugurated the expansion to Terminal 2. The former Prime Minister Hailemariam Desalegn had purportedly given permission to build a new international airport in the town of Mojo, 65 kilometers south of the capital's current airport. The senior official at the Ethiopian Airport Enterprise said that the officials of the enterprise and the Ministry of Transport briefed the Prime Minister about the planned grand airport project. Two other sites are also options. The airport has two terminals with a total of 11 gates, plus more than 30 remote aircraft parking stands behind both Terminals. Terminal 1 has 4 gates and Terminal 2 has 7 gates. 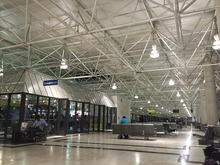 Terminal 1 serves Domestic and Regional flights for Ethiopian Airlines, EgyptAir, Qatar Airways, Sudan Airways, and Yemenia. Terminal 2 serves International flights and the rest of the airlines that serve the airport. In 2012, Ethiopian Airlines opened the first phase of its Cloud Nine Business Class Lounge at Bole International Airport. This will provide premium travelers with modern facilities and amenities. The second phase of the lounge's construction will include a spa, private digital lockers for passengers to stow away their bags, and a traditional Ethiopian coffee corner. Once complete, it will be three times the size of the existing lounge. Cloud Nine features a quiet corner with sleeping cots and individual reading lamps, massage chairs, and an internet corner with free Wi-Fi connection. The lounge is part of the airline's "Vision 2025 Fast Growth Plan". In 2017 Ethiopian Airlines Group announced that it signed $350 million contract with China Communications Construction to build a new hub, a part of which will be open to the public no later than June 2018. On 18 March 1980, Douglas C-47B ET-AGM of Ethiopian Airlines crashed while on a single engined approach to Bole International Airport. The aircraft was on a training flight. On 10 March 2019, a Boeing 737 MAX 8 of Ethopian Airlines operating as Ethiopian Airlines Flight 302 bound for Nairobi crashed shortly after take off from Bole International Airport, killing all 157 people (149 passengers and 8 crew members) on board. ^ "Fastest Growing Airports 2018". routesonline.com. Retrieved 9 March 2019. ^ Underwood, John (12 April 1965). "The Number Two Lion in the Land of Sheba". Sports Illustrated. Retrieved 3 April 2018. ^ "Ethiopian – Aviation Academy". Ethiopian Airlines. Retrieved 3 April 2018. ^ "(ADD Arrivals) Addis Ababa Bole International Airport Arrivals". FlightStats. Retrieved 19 June 2018. ^ Airlines, Ethiopian. "History - Ethiopian Airlines". www.ethiopianairlines.com. Retrieved 3 April 2018. ^ a b c d "Bole International Airport (ADD/HAAB) - Airport Technology". Retrieved 3 April 2018. ^ a b "IRIN Africa - ETHIOPIA: State of the art airport terminal opens - Ethiopia - Economy". IRINnews. Archived from the original on 11 September 2014. Retrieved 3 June 2015. ^ "New terminal opens in Ethiopian capital". Duty Free News International - Travel Retail News. Retrieved 3 April 2018. ^ "Ethiopia: State of the Art Airport Terminal Opens". 22 January 2003. Retrieved 3 April 2018 – via AllAfrica. ^ "The New Bole International Airport Terminal Due to Open in May 2001". www.ethiopians.com. Retrieved 3 April 2018. ^ "Ethiopia industry: EAL opens cargo terminal at Addis Ababa's Bole airport. - HighBeam Business: Arrive Prepared". HighBeam Business. HighBeam Research. 6 June 2006. Archived from the original on 11 September 2014. Retrieved 3 April 2018. ^ "Ethiopia: Airbus Superjumbo A380 lands in Ethiopia". Nazret. 17 October 2006. Retrieved 3 April 2018. ^ "Picture of an Airbus A380-861 at Addis Ababa-Bole International Airport". Airliners.net. Retrieved 3 April 2018. ^ Tekleberhan, Meron (20 February 2012). "Ethiopia Signs Air Services Agreement with Singapore". Retrieved 3 April 2018. ^ "Ethiopian News: First Phase Expansion Work At Addis Ababa Airport Completed". 21 June 2012. Retrieved 3 April 2018. ^ "• The African Aviation Tribune •: ► ETHIOPIA: Bole International Airport expansion tenders awarded; new apron to be completed by January 2013". 24 September 2012. Retrieved 3 April 2018. ^ "Ethiopian Airports Enterprise to expand passengers' terminal of Bole Airport". 2 July 2012. Archived from the original on 25 February 2015. Retrieved 3 June 2015. ^ "1st phase taxiway expansion of Bole International Airport completed". 21 June 2012. Archived from the original on 25 February 2015. Retrieved 3 June 2015. ^ "Addis Ababa expands to match Ethiopian's growth plans". Retrieved 3 April 2018. ^ Steinmetz, Juergen T (21 April 2018). "Addis Ababa Airport expansion progress | Travel News | eTurboNews". Travel News | eTurboNews. Retrieved 19 June 2018. ^ "Ethiopian Prime Minister Hailemariam Desalegn Gives the Green Light to Build a Huge International Airport in Mojo, 65km from Addis Ababa". Meles Zenawi. 3 November 2012. Retrieved 3 April 2018. ^ Bekele, Kaleyesus (13 October 2015). "Ethiopia Prepares to Build Major Hub Airport for Africa". Aviation International News. Retrieved 3 April 2018. ^ "Ethiopia - Bole Airport to move regional flights to Terminal 1". Nazret. 4 January 2011. Retrieved 3 April 2018. ^ "ETV News - Bole International Airport domestic terminal to be a hub for eight East Africa Airlines". Retrieved 3 April 2018. ^ "Ethiopian Airlines unveils business class lounge at Addis Ababa Airport". Nazret. 21 November 2012. Retrieved 3 April 2018. ^ Derso, Bilal (22 November 2017). "Ethiopia: Airport Expansion Key in Maintaining Ethiopian Leading Status". Ethiopian Herald. AllAfrica. Retrieved 3 April 2018. ^ "Eritrean Airlines adds Addis Ababa service from mid July 2018". routesonline. Retrieved 18 October 2018. ^ "Ethiopian Airlines adds Houston service from late-June 2019". RoutesOnline. 4 April 2019. Retrieved 4 April 2019. ^ "Ethiopian adds Livingstone service from late-June 2019". Airlineroute. 26 February 2019. Retrieved 26 February 2019. ^ "Rwandair adds Addis Ababa service from April 2019". routesonline.com. 4 January 2019. ^ "Istanbul New Airport Transition Delayed Until April 5, 2019 (At The Earliest)". ^ "Emirates SkyCargo Freighter Operations get ready for DWC move". Malta Independent. 9 April 2014. Retrieved 3 April 2018. ^ a b "Ethiopian Airlines launches historical cargo route at MIA". www.prnewswire.com. 30 August 2018. Retrieved 30 August 2018. ^ "Stakeholders praise govt for cargo flights into Enugu - The Nation Nigeria". 30 August 2016. Retrieved 3 April 2018. ^ a b "Ethiopia: Ethiopian Airlines Started 2 Cargo Routes". www.2merkato.com. 3 April 2017. Retrieved 3 April 2018. ^ a b "Ethiopian Cargo adds Nanjing service from May 2018". Airline Route. 25 June 2018. Archived from the original on 28 March 2014. Retrieved 25 June 2018. ^ Ethiopian AirlinesEthiopian Airlines. "Redirecting to Fly Ethiopian". Archived from the original on 11 April 2014. Retrieved 3 June 2015. ^ "ET-AGM Accident description". Aviation Safety Network. Retrieved 3 April 2018. ^ Wenzel, Nick (10 March 2019). "Ethiopian Airlines flight ET302 crashes shortly after takeoff". International Flight Network. Retrieved 10 March 2019. Airport information for HAAB at World Aero Data. Data current as of October 2006.